The ocean lies ahead of you in this immersive virtual tour that has you swimming beneath the water surface as you follow and view the scenery around you. Downloaded from the Gear store for a hefty $12, you simply choose the creature you wish to view and swim around taking in the oceans wonder. Controls are simple, look where you wanna swim and hold your finger on the touchpad to swim. Visually this game uses the limitations of the gear to its advantage with the low draw distance offered by many other games rendered moot by the “murkiness” of the ocean before you. Animals swim and move in very natural patterns and look great, even when you get really close. 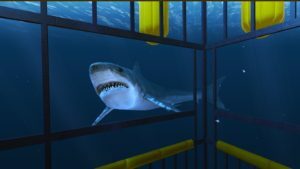 The free demo offers a few animal ranging from turtles to great white sharks, but where the experience gets cool is what you get with the paid version. A few more modern age animals are unlocked along with a few dinosaurs and watching those guys swim around is a childhood dream come true. Audio as well lends itself well the game and does make you feel like you are below the surface, headphones are a must. Controls are super simple, you simply touch the touch pad to swim in the direction you are facing and swiping horizontally or vertically on the pad moves you in that direction. Using a controller gives you a few more options, but they don’t change up gameplay too much. Changing between the animals you want to view is done by simply choosing from the touch pad menu or by just swimming around and seeing what you find. I did notice on a few choices that when I picked an specific animal, it didn’t immediately show up and trying to find them proved difficult and did get a bit annoying. For what this game offers I definitely recommend trying the free demo, if you like what you see and are willing to spend a few bucks than I would definitely say do it. For its shortcomings, it’s still a great app to play around with, and viewing the wide variety of animals is a treat, even if some take a while to find. With great visuals and audio, this experience plays out like a virtual tour of the ocean world and if that sounds like something you’d like than this app is a treat.